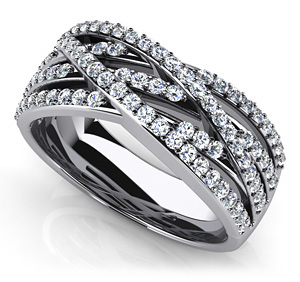 This anniversary ring showcases a beautiful interlaced display of diamonds, perfect for your loved one. The unique design is sure to capture the attention of your friends and family and will be the highlight of your special occasion. Customize your ring by selecting a metal type and diamond quality to create the perfect ring. Approx. Metal Weight: 8.00 Gr. Stone Carat Weight: 93X0.007 ct.